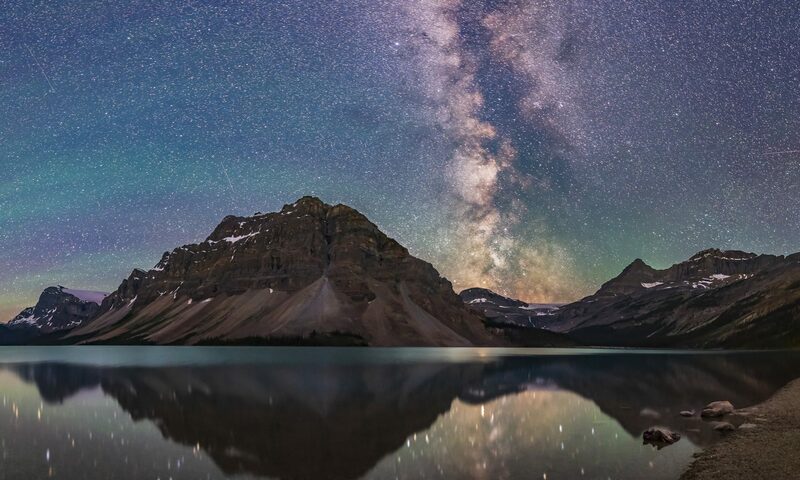 On March evenings the Milky Way arches overhead in a magnificent river of starlight. This is the panoramic view we are getting every night this week at our astronomy retreat in New Mexico, as we gaze upwards to the northern winter Milky Way running across the sky from northwest to southeast, from Cassiopeia at right to Vela at left. In the middle you can see the stars of Orion and his familiar Belt. On March nights we are gazing outward, to objects farther out than we are from the centre of our Galaxy. This part of the Milky Way is dominated by stars and nebulas around the Orion complex several hundred light years away. Above the main house a pillar of light rises from the western horizon and tapers out as it reaches the Milky Way high in the west. That’s the Zodiacal Light caused by sunlight reflecting off comet dust in the inner solar system. You need to be at a fairly dark site to see it, with no prominent urban sky glows to the west. But springtime is the best season for seeing the Zodiacal Light in the evening sky. From the latitude of New Mexico the Zodiacal Light rises almost straight up, perpendicular to the horizon. Here, Jupiter sits at the apex of the Zodiacal Light. So this panorama includes the Earth, objects in our solar system (Jupiter and comet dust), and the distant stars and nebulas of the Milky Way Galaxy we live in. For this scene I shot a panorama of 4 segments, each consisting of 2 images stacked for noise smoothing, and the segments stitched with Photoshop. Each frame was a 3-minute exposure with the Samyang 14mm lens at f/2.8. The camera was on a tracking platform, so it followed the sky during the 25 minutes or so it took for me to shoot the entire panorama. I reframed the camera between each segment to try to get the horizon and landscape horizontal and lined up as best I could from segment to segment. The ground is from one frame out of each segment and is blurred slightly because the camera was tracking the sky. Despite shooting a moving target, Photoshop was still able to automatically assemble the frames into a seamless panorama that, in this case, covers about 250°. This was the first time I attempted such a tracked panorama. I was impressed that it worked!